Over two million of us work from home and that figure looks set to grow as more people swap office life for home working. However, the convenience of tele-working comes with its own drawbacks, in particular the loss of a room in the house and the feeling of never really ‘leaving work’. This is why many people are now creating dedicated work spaces in their gardens, away from home life and all of its distractions. 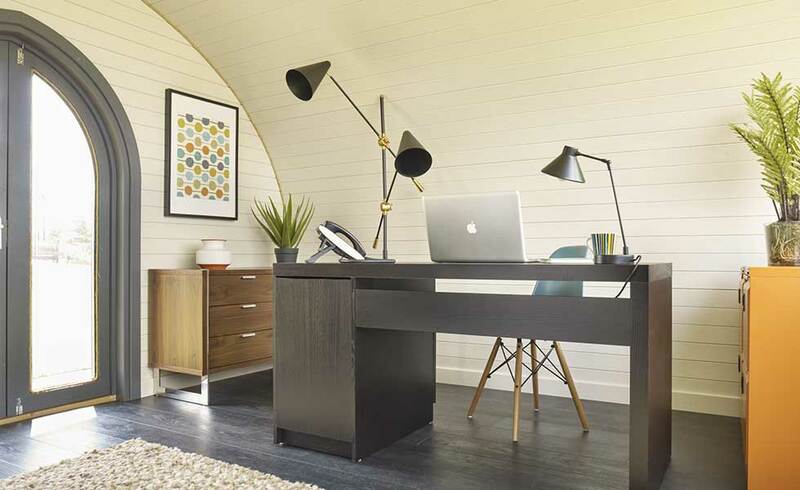 Whether you fancy a big DIY project, or will find a specialist company to take on the work, we look at what to consider when building a garden office. How Big Can a Garden Office Be? Where you plan to site the new building is also important. 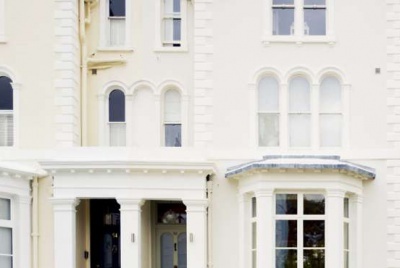 If it will be within five metres of your home (and over 10m²) it will be treated as an extension to your house. Your local authority will then count it as part of your permissable development. This may be a problem if you already have a large extension to your home. It also cannot sit forward of the principal elevation of the original property. At the planning stage, consider creating a hard path leading to its entrance so you don’t churn up the grass. Trees or shrubs screening the building will make it less conspicuous, and maintain privacy for you and any neighbouring properties. In addition, your neighbours may object if the room blocks light to their property or overlooks them. Always contact your local authority’s planning department and ask their advice. You may be asked to send in a sketch with the dimensions and location in your garden. Your council office’s planning department should let you know within two weeks if it needs planning permission. Building Regulations don’t apply to the building of a timber cabin as it is classed as a ‘temporary structure’. If you have a large garden, aim to get your new building to face south. You can even add roof windows, as well as a sink, toilet or work surfaces. Bear in mind that a garden room is often an easier target for an intruder than a house. Police initiative Secured by Design offers tips on keeping your property safe. Fit a PIR light and alarm to sense movement. Buy metal security casings for PCs and lock these to the walls. A gravel path to the building can act as a deterrent to intruders. Ensure all doors and windows have locks that meet your insurer’s standards (BS 3621 is usually cited). 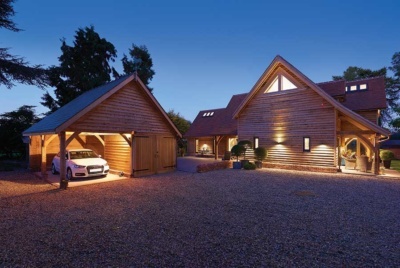 Timber clad buildings are a popular choice as they can match both traditional and contemporary properties. For a low maintenance option, choose thermally-modified timber — it will cost more initially, but the alternative if treating the cladding with preservative every two to three years. Brick and block requires very little maintenance, but will add to the cost of the project. As will the inclusion of a lot of glazing. Alternatively, you could look at the many unusual buildings such as shepherds’ huts, tabernacles and modified gypsy caravans that can be quickly installed as garden offices. To meet planning requirements (or not need planning as the case may be), find a garden room which meets the permitted development criteria listed above. 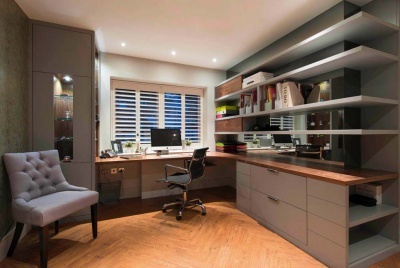 Size, construction type and whether you take the DIY approach will all have an impact on the overall cost of your garden office. A DIY kit can cost as little as £1,000 for a 3x3m, uninsulated cabin. Bespoke options can cost as much as £30,000 for a fully-insulated, glazed, wired, heated and finished option. Cabin Style: Softwood tongue-and-groove boards interlock at the corners to form a cabin with a pitched roof. You only need a few metal fixings for the roof and floors and the rest locks together and can be built up in a couple of days. B&Q’s range starts from around £1,600. The glazing is plastic but you could fit your own double glazed units. 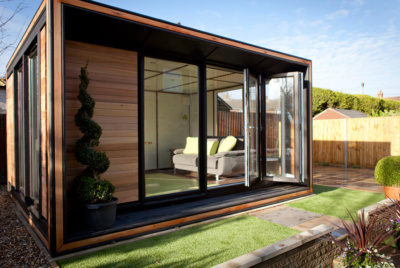 A 3x3m cabin from Garden Affairs in 44mm timber and a range of door/window styles starts from £3,815. Modular: Basically mini houses, with softwood clad walls filled with insulation and plasterboard interiors. These buildings can also be assembled quickly. Doors and windows are often Pilkington K double glazed units. The Garden Escape can supply anything from a 7.2 to a 19.8m² unit with insulation, electrics and phone points installed from £7,500. Timber Frame: If your wallet stretches to £10,000+ a timber framed building is the ultimate hideaway. 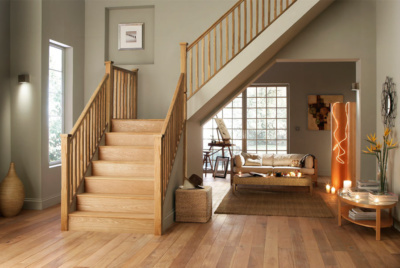 Choose weatherboarded or rendered panels, an oak frame, roof tiles or even a thatch roof. Courtyard Designs offer 10x15ft–20x15ft offices with a double glazing, high security locks, wiring, lighting and insulation from around £21,000–£28,000. How to Heat and Insulate Your Garden Office? A cold and draughty garden office is not going to be an appealing place to work, so when it comes to insulation, treat it like a habitable space. Basic versions, or glorified sheds, will need added insulation, but most garden offices on the market are either modulate or closed-panel builds with insulation already incorporated. You will also want to choose double glazing and a well-insulated door to keep a comfortable temperature year-round. Electric radiators or electric underfloor heating are practical as your office will need to be connected to main electricity anyway. However, heating with electricity can be expensive so consider adding a woodburning stove instead, and focus on good insulation. It might also be worth considering renewables. What Else Could I use it for? Many log cabins are bought as home offices and it’s not difficult to see why — you can claim back the messy spare bedroom, save travel time and possibly some of the building costs against your tax bill. However, there are many other uses for a garden room. Although it may seem more convenient to have a home gym in your loft or spare room, there are usually too many distractions to make a serious workout possible. It’s also difficult for a guest bedroom filled with fitness equipment to look welcoming. Check that your new building’s floor is strong enough for weights and fitness machinery. A concrete slag base is a better bet than tongue-and-groove flooring. Cabins make excellent music rooms, but soundproof walls to keep noise to a minimum for neighbours. If you are an artist, a garden room can be the perfect studio as it can be easier to get natural light in. Many of us crave a private den or hobby workshop and again a space away from the house is often the best solution, especially if your hobby uses noisy tools or requires storage space. Remember that for it to be built without planning permission, it’s use must be ancillary to the main home, meaning you can not use it as a holiday let, granny annexe/spare bedroom or other self-contained living area.